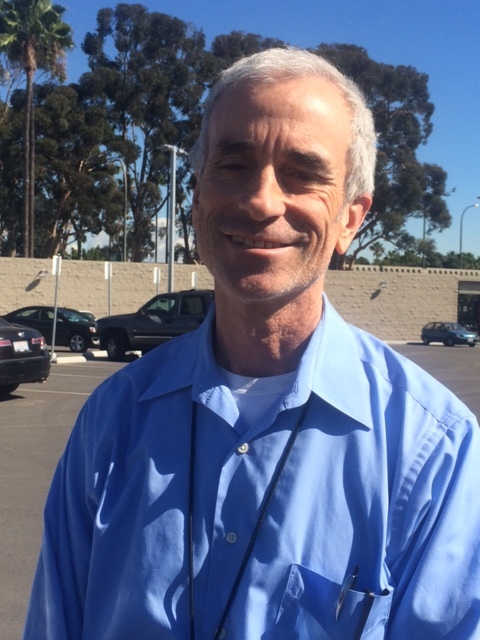 Profile Response: Lee Peterson, Port of Long Beach, Long Beach, CA | How Will We Live Tomorrow? Everyday, everyday objects travel halfway around our world. Dental floss, ballpoint pens, yo-yo’s are made in Asia and shipped here. Sometimes items crisscross multiple times. Wood pulp is shipped to Japan, turned into paper and shipped back here. Silicon Valley computer chips are shipped to China, assembled into computers, and shipped back to Silicon Valley. All of this movement is predicated on the same two things that drive every business: money and time. As long as Asia’s labor + shipping costs remain lower than ours, manufacturing and assembly will utilize long distance transport. And today, as in millennia past, shipping is the cheapest way to transport a lot of stuff. Everything about the Port of Long Beach is gigantic. Over 3,000 acres of piers jut into the Pacific Ocean at the end of the Los Angeles River; 31 miles of engineered coastline. Two thousand vessels dock annually at 62 berths scattered among 24 terminals. More than 68 gantry cranes unload goods. Pier T, the busiest crude oil terminal in California, empties tankers into pipelines direct to a half dozen SoCal refineries. Close to a million containers are unloaded and loaded at the Port of Long Beach every year. The six container terminals handle 70% of the port’s cargo. It takes five to six days to unload a 14,000 container ship, the largest on the sea today. Every container has an RFID code that describes where it’s been, where it’s going, and what’s inside. Data that customs officials and transit companies need to know. Almost a third of those containers go directly from ship to railcar. Even more are loaded directly on to trucks. Very few containers ever touch the ground. Container ships only get bigger. Next year, the first 18,000 unit ships will arrive. More than four football fields long. Fifty times longer than Long Beach’s pride, the Queen Mary, container ships are the largest man-made objects on earth. 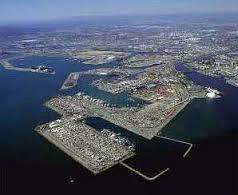 The Port of Long Beach is the second largest port in the United States. The only thing bigger is the Port of Los Angeles, right next door. The contiguous pair dwarfs any port on either coast. At 76 feet of water depth, LA/LB are the deepest US ports; they came to dominate the market in the 1970’s when they embraced container shipping. Lee Peterson, Communications Director, toured me through the port. At first, he focused on the bicycle projects – an expanded bike lane to link cyclists to a community fishing pier and dedicated bike lanes on a new bridge. I was glad the port cared about making this industrial area bike friendly, but more amazed by the numbers – again gigantic – that Lee quoted. The replacement bridge over the back channel: $1.5 billion. The upcharge for bike lanes: $50 million. This entry was posted in Responses and tagged Bill Peterson, container shipping, Long Beach CA, Port of Long Beach. Bookmark the permalink.